Justin Timberlake Archive - JT Surprises Ellen on her 2000th Show! You are here: Home / News / JT Surprises Ellen on her 2000th Show! JT Surprises Ellen on her 2000th Show! Today, Justin and Jennifer Aniston surprised Ellen during her 2000th episode! Check out the highlights below! I watched the show live. It was amazing. Ellen is really fantastic ! You're doing a great job ! Best show I've ever seen ! The show was good. I loved the montage that they had of Ellen through the years. Especially the woman who loves Jesus but likes to drink. Watching Ellen crack up made me laugh even harder. So cool that Jennifer Anniston and Justin came by to help her celebrate."surprise! "(lol) I was in tears. 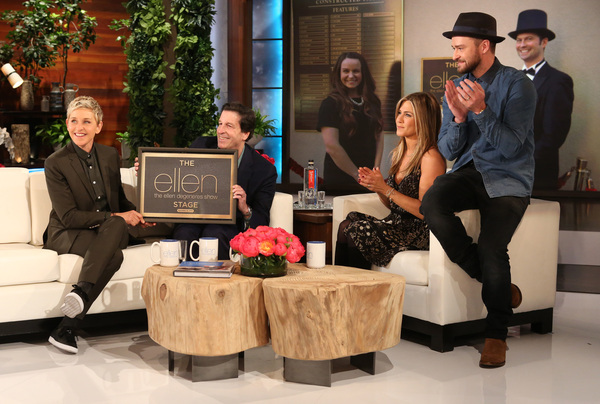 2,000 shows what an accomplishment and to have the studio name the Ellen show studio is awesome! Congrats Ellen!